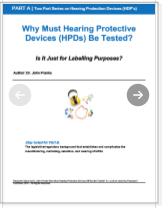 Why Must Hearing Protective Devices (HPDs) Be Tested? Is It Just for Labelling Purposes? Why Must Hearing Protective Devices (HPDs) Be Tested? Here’s your problem: You have a noisy workplace or workplace activity and you have a person who works in that noisy workplace or conducts the noisy workplace activity. You want to protect the person’s noise-exposure level so you turn to the Noise Reduction Rating (NRR) value from a Hearing Protective Device label to guide you in your choice of product. You do your calculations and trust the testing procedures to again guide you to make the best choice of HPD. What should the concerned industrial hygienist, audiologist, or consumer do to protect the person’s noise-exposure level? Rule 1. Be informed. The primary problem with HPDs is that they vary widely in effectiveness from individual to individual. Recognize that whatever rating value is on the label, it is a lower boundary, not a benchmark. Rule 2. Recognize that HPDs, the head, and the ear are complex systems. The acoustics of HPDs aren’t accurately described by the principles of acoustics that were derived for large-scale systems such as walls, doors, windows, churches, and concert halls. HPDs and the head and ear to which they couple are a complex system. Change one element, or one part of one element of that system, and the entire system changes affecting the effectiveness of the HPD. Rule 3. Employ fit testing if possible. The so-called gold standard for determining the effectiveness of an HPD is Real-Ear Attenuation at Threshold (REAT). The any type of fit-testing procedure is referred to as FAES – Field Attenuation Estimation System. The purpose of FAES is to insure that whatever HPD is used is effective for the individual’s noise exposure level. Rule 4. Select the HPD with the lowest possible NRR or, if available, the best SNR(SF84) for the noise exposure levels of concern. The trend for the past 50 years has been to select the HPD with the highest NRR. This has resulted in many HPDs on the market that at face value are horribly overprotective. Rule 5. Check the testing laboratory and the date of the testing. In general, try to ascertain if the testing laboratory is independent from the manufacturer. . Also, confirm that the laboratory regularly tests HPDs. For some products the data may be more than 30 years old from a laboratory that tested only one product. Also beware of excessively small standard deviations on the label; values less than 3 dB are suspicious. Please Note: Subscribers will be asked to verify your email address. Once the email has been verified and the Subscriber has “opted in”, the subscriber will receive a link to the Case Study.